Family Events, producer of the Lucas Oil Off-Road Expo powered by General Tire, is excited to announce the 2015 Off-Road Gear Guide - an annual publication dedicated to showcasing industry trends and the latest products and innovations from the industry's top manufacturers. In addition to the print version, the Guide will live year-round online at www.OffRoadExpo.com. This first issue of the Off-Road Gear Guide serves as the Off- Road Expo event guide, as well as a resource for the best off-road products and gear including helpful tips and insight from off-road industry experts. Tech stories will detail ways to build better, faster and safer off-road vehicles, and a firsthand look at some of the coolest 4x4 concepts from Jeep will also be included. 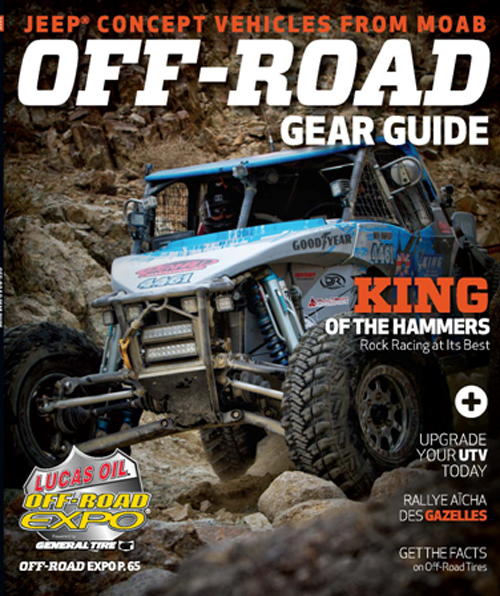 The 2015 Off-Road Gear Guide also plugs readers into some of the most exciting off-road motorsports events and races around the world, including the Nitto King of the Hammers and SCORE International desert racing — and let us not forget the ladies of off-road, making their journey from the U.S. to Morocco across the Sahara Desert in the Rallye Aïcha des Gazelles. "I am very excited about how this first issue of the Off-Road Gear Guide turned out," said Jaime Hernandez, editor, Off-Road Gear Guide. "A lot of effort went into putting together these feature stories, tips and insights for the readers. They can use this magazine to better prepare for the dirt, build their ultimate rig, or start planning for the adventure of a lifetime." The 2015 Lucas Oil Off-Road Expo powered by General Tire will take place Saturday, October 3, from 9:00 a.m. to 6:00 p.m. and Sunday, October 4, from 9:00 a.m. to 5:00 p.m., at Fairplex, located at 1101 W. McKinley Avenue in Pomona, Calif.
Discount tickets are on sale now at O'Reilly Auto Parts for $13 adults and $6 children (ages 6-12). Kids 5 and under are free. Tickets may also be purchased online at www.OffRoadExpo.com, or on-site for $15 adults, $6 children. A Family Four Pack is available for $28 and includes admission for two adults, and two children (available online only through Friday, October 2). For more information, visit www.OffRoadExpo.com. Follow Off-Road Expo at facebook.com/OffRoadExpo, Twitter @OffRoadExpo and Instagram at @offroadexpo1.